SAN FRANCISCO, CA.— Every year, The Moscow Ballet embarks one of its Vaganova-trained master teachers to over 70 cities where they stay for four months working as Audition Director to American-trained dance students who are enrolled in a program called “DANCE WITH US”. The duties of the Director, are to audition, rehearse, and train these students. Those dancers, selected after two months of auditions, are trained and coached for six weeks to get them ready. 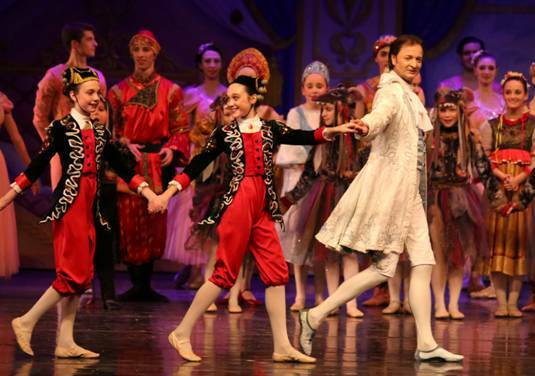 In November and December they dance, alongside the professional Moscow Ballet’s dancers, in their yearly Holiday production of THE GREAT RUSSIAN NUTCRAKER. 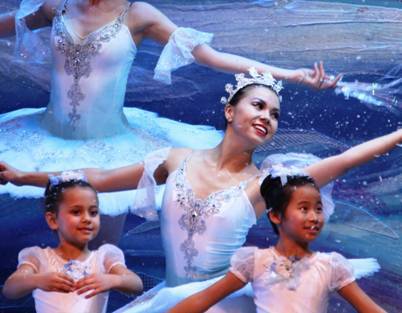 Being part of the program give those students many advantages: They are trained by a professional ballerina, get to be acquainted with the “real” world of dancing, and will be provided with all their costumes. But best of all, at the end of their training, they will be given the unique chance to share the stage with the professional dancers of The Moscow Ballet during all the performances of the GREAT RUSSIAN NUTCRACKER, to be presented this year in San Francisco, Cupertino, Santa Rosa and Stockton. For dance students, ranging in ages from 7 to 16 years old, getting the opportunity to audition for the program is very simple. All it requires is that either their mothers or an adult relative, send an e-mail to The Moscow Ballet, at www.nutcracker.com (adding their name and e-mail at the right corner.) and request to be enrolled in their roster. Those enrolled, will receive a monthly letter in their e-mails which will give them information about Dance. 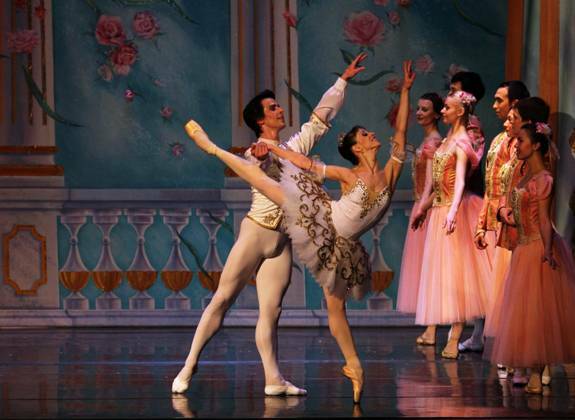 Including the times and places of the Summer, and the Master classes, at The Moscow Ballet. This letter will also inform the parents of the dates, places and hours where the “DANCE WITH US” auditions for 2016 will be held. C.W.B: How is your NUTCRACKER different? M.S. 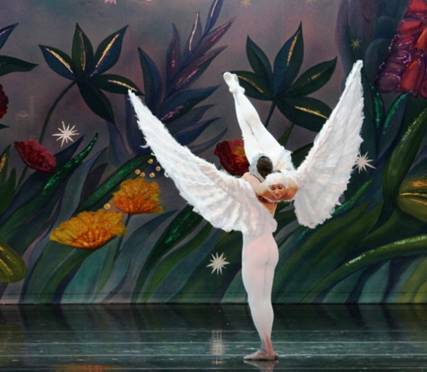 "One of the things that is exclusive of the Moscow Ballet is the two persons “Dove of Peace” (created by STANISLAV VLASOV in l993 for the GREAT RUSSIAN NUTCRACKER) a ballet in which two dancers (each with one wing which is 10 feet long and feathered) form a huge flying dove. We must add that the Moscow also have a very elaborate choreography for The Turkish dance, The Chinese Dance and The Spanish dance, and that some of these dances are performed by their professional dancers and the “DANCE WITH US” children. C.W.B. As the Audition Director of the “DANCE WITH US” program, can you tell our readers something about your students? C.W.B. How many did you select? M.S. “This time I selected sixty children because we have a lot of clothes (costumes) for them. C.W.B. What do you do next? C.W.B. You have a lot of work. "I don't mind," she tells us smiling. "I love ballet, and I love these kids, they work very hard." MARIIA, who is herself a professional dancer, will also be dancing along with her students in all the California performances of THE GREAT RUSSIAN NUTCRAKER, a unique ballet that will allow the audience to see, perhaps for the first time, 40 professional dancers of the world's famous Moscow Ballet including two principal dancers EKATERINA BORTIAKOVA dancing the role of Marsha and AKAZHOL MUSSAKHANOV dancing the role of the Nutcraker's prince. The GREAT RUSSIAN NUTCRACKER will be presented at the Warfield Theatre in San Francisco on Saturday November 28 at 3p.m.and at the Flint Center for the Performing Arts at De Anza College in Cupertino on Friday December 18, at 4pm and at 8pm.